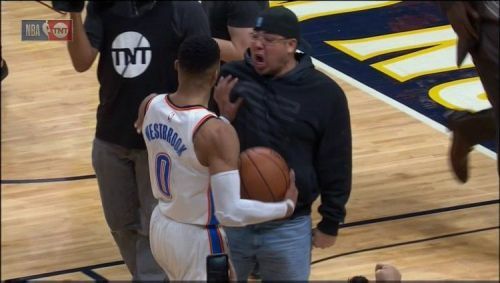 During the Oklahoma City Thunder's trip to the Utah Jazz, Russell Westbrook once again made national headlines after clashing with a rival fan. 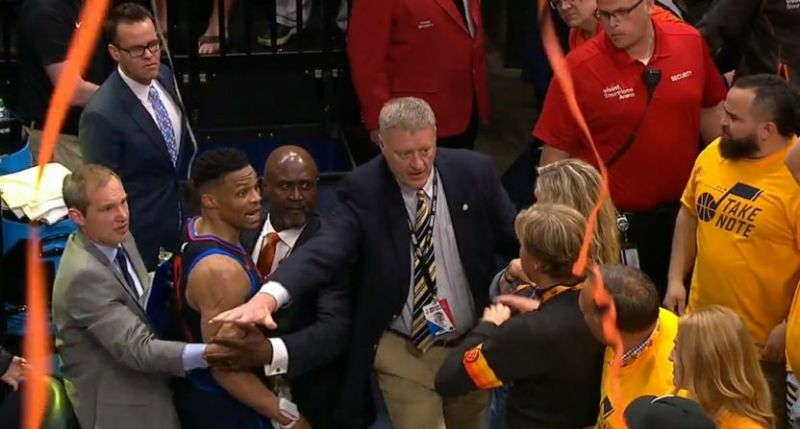 The incident occurred when Westbrook threatened a home supporter during the second quarter of the Thunder's 98-89 win and Westbrook received considerable criticism in the immediate aftermath. Nevertheless, it soon emerged that the fan involved in the incident had been shouting racially charged comments at the 2017 MVP, and the Jazz fan was subsequently banned for life, while Westbrook was handed a $25,000 fine for expletive language. However, this was not the first time that Westbrook has been involved in a notable exchange with a rival fan, as the 30-year-old's passion for the game has often spilled over into interactions with the crowd. So, here are three times that Westbrook notably clashed with opposing fans. Back in February 2018, the Thunder headed to Denver to face the Nuggets in a crunch clash. Entering the game, both teams were jostling for a playoff spot in a competitive Western Conference, and despite a brave second-half comeback from the Thunder, Gary Harris hit a buzzer-beating three to secure the game. In the aftermath, the Denver players swarmed around Harris to celebrate, and amidst the chaos, one fan made it onto the court, screaming in Westbrook's face. The Thunder guard responded by shoving the Nuggets spectator, and the fan quickly disappeared from view. The NBA subsequently investigated Westbrook's actions, although the point guard faced no punishment as he had simply stood his ground. Meanwhile, the fan in question was removed from the arena by security and was subsequently banned from attending future Nuggets games.